During the bleak, cold days of winter, it is easy to neglect your housekeeping and go into hibernation. Now that spring is here, you may feel overwhelmed and buried in clutter—especially in the kitchen. This year, try a plan that will not only get your kitchen organized, but will help keep it that way. Here are some great hacks to organize your kitchen this spring. All of us are guilty of stuffing things in kitchen cabinets and drawers to get them out of sight. Before you can organize your kitchen, you must clear out everything—even the dreaded “junk” drawer. Be determined to get rid of anything you have not used in the last six months. If you cannot sell, donate, or recycle the item, pitch it in the dumpster. If an item is not used in the kitchen, then it does not belong there. Relocate orphaned items to their proper place. You may be surprised at all the new space you have cleared! 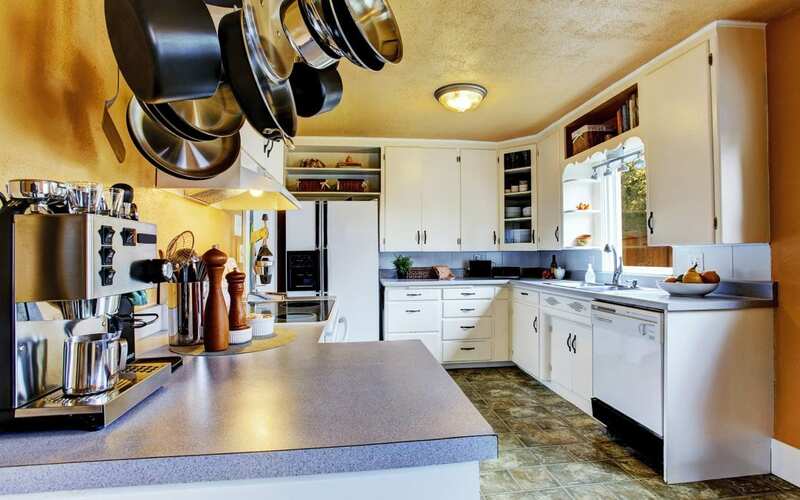 Now that you have removed useless clutter, give the kitchen a thorough cleaning. An article from HGTV.com recommends a quality degreaser or multi-surface cleaner. Clean the room from the ceiling to the floor. Wash out the cabinets, drawers, and all surfaces. After you clean out the fridge and stove, pull them out and sweep behind them. You will have a tidy kitchen for organizing all your tools and supplies. Your counters are prime real estate, and should only hold those things that you use every day. Some of these things include a coffee maker, paper towels, and a container of frequently-used utensils. Resist the urge to clutter your counters with gadgets that you rarely use. Relegate these things to upper cabinets or place them in your pantry. Do you enjoy cooking? Then you probably have an impressive collection of herbs and spices. When stored properly, dried spices should last between 3 to 4 years. Some spice containers have a printed expiration date. Weed through your spice collection and discard anything that is stale or expired. How you store your spices depends on preference and the space you have. Ideally, your herbs and spices should be close enough to grab while you are cooking. Store them in their original air-tight containers, in a handy drawer, cabinet, or spice rack. Instead of organizing them alphabetically, consider grouping your spices according to their use, i.e., baking spices, savory spices, etc. Keeping your spices fresh and organized saves you time and money in the kitchen. If you want to maximize space in your kitchen, consider installing a hanging rack for pots and pans. They are an attractive way to display your cookery and provide easy access when you prepare meals. If a hanging rack is not possible, stack your pots and pans neatly in a cabinet close to the stove. Use a decorative crock for storing cooking utensils, or organize them in a drawer. You may also consider hanging utensils with your cookery, and storing knives on a magnetic strip that mounts to your wall. When you organize your kitchen, it will be more inviting and space-efficient. It may take a weekend to tackle the job, so you might do it as a couple or family. After you kick the clutter and create a space for everything, the kitchen will be easier to clean. Appalachian Inspection Services provides comprehensive inspection services to Asheville, Buncombe County, and the surrounding areas in Western North Carolina. Click here to request your inspection.